He criticized China for its militarization of the South China Sea. He criticized China on several fronts, portraying the country as the foremost threat to the U.S., its interests around the world and even its politics at home. He accused the growing Asian economic power of trying to undermine President Trump. In particular, he went after China’s growing military and militarization of islands in the South China Sea, its trade practices and intellectual property theft, its increasing control of the Chinese public and crackdown on religious groups at home, its pressure campaign against political opposition or criticism in academia and entertainment and its political interference in the U.S. and around the world. Most of all, he blamed this new campaign on Chinese opposition to Trump. “President Trump’s leadership is working and China wants a different American president,” he said. 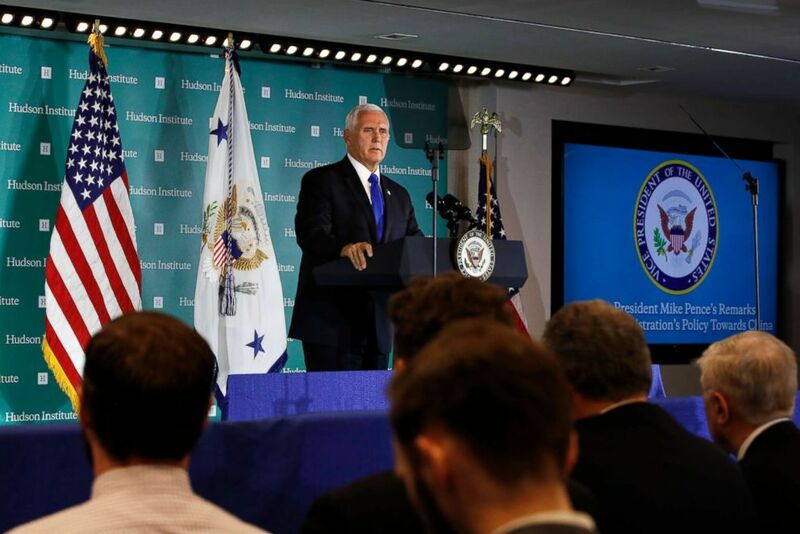 (Jacquelyn Martin/AP Photo ) Vice President Mike Pence speaks at the Hudson Institute in Washington, Oct. 4, 2018. Pence said China was interfering in the domestic policies and politics of the United States. The aggressive tone comes amid deteriorating military relations between the two countries, including a Chinese ship's unsafe maneuver near the USS Decatur. Defense Secretary Jim Mattis recently canceled a trip to China although Secretary of State Mike Pompeo will meet with Chinese officials over the weekend. Last week at the United Nations Security Council, President Trump first said that China is interfering in the 2018 midterm elections. Pence followed that up, saying that intelligence assessments found that China is targeting U.S. state and local governments to exploit divisions between federal and local levels on Trump’s policy. By using covert actors, front groups and propaganda outlets, he said, China is trying to create divisions and shift Americans’ views to favor Beijing. While most of the public’s attention has focused on Russian interference in the 2016 presidential election and its continued cyber and disinformation operations, Pence said for the first time that “what the Russians are doing pales in comparison to what China is doing across this country,” citing a senior intelligence official. But he did not provide specific examples beyond quoting the administration’s own officials, even on the same day that the Department of Justice announced new indictments of Russian intelligence officers for their cyber-attacks. He also didn’t detail how the administration plans to push back on this influence campaign. But those economic thefts are becoming military threats, he warned in some stark new language. “Chinese security agencies have masterminded the wholesale theft of American technology, including cutting-edge military blueprints, and using that stolen technology. The Chinese Communist Party is turning plowshares into swords on a massive scale,” Pence said. “Today, America is reaching out our hand to China and we hope that soon Beijing will reach back with deeds, not words, and with renewed respect for America,” he said. But he added that the administration would not relent until then.